The Opinionated Pussycat: Catnip: The Feline Drug of Choice! Good morning felinity assembled! The above photo was taken in Sept. 2010, just 3 months after I entered and disrupted the lives of my 2 adorable bachelors. 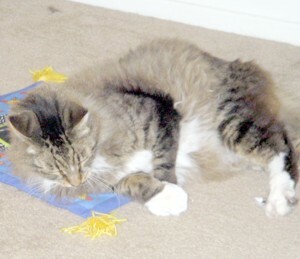 This series of photos, from August 2010, show me getting catnip lessons from Nikita. All the photos turned out to be ones Daddy Kiril, Nikita and I forgot he had taken! Great Ball of Catnip! Party! Party! It was a SmartKat Catnip Kiss. Concentrated, Compressed, Catnip that was huge! All Hail the Boogie Mat! My Bestest, Favrit, Loverly, Play Toy! Wheeee!! A year ago, this month, Daddy came home from work, and gave me a prezzy! A delight, wunerf, lovely Boogie Mat!!! Boogie, Boogie, Zooom! Wheee, I'm dizzy!! Hee, hee!! Wheee!! 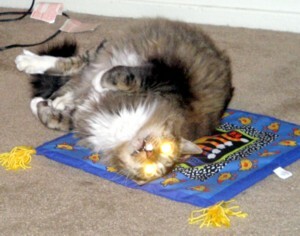 I looove good quality Catnip, yes I do!!! Sorry, but I'm snook, snock, snick, um Higher than a kite, at the, um right now, hee, hee! Just so you know... 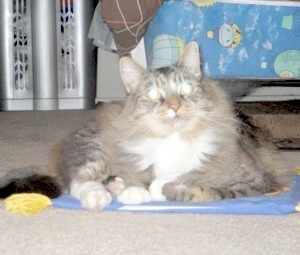 I may be buzzed, but the eyes are from the flash of Daddy's Camera, and not the 'Nip! Nikita forgot to save his post, so I'm going to have to do it for him. I also uploaded the photos as he is barely able to use the keyboard in between fits of the giggles. The pics will give you an idea of what's happening in front of me at this moment. 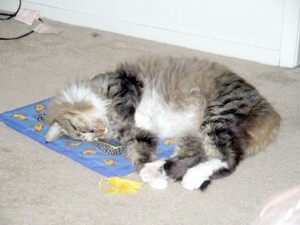 I believe in moderation where that bit of bliss, known as Catnip, is concerned. 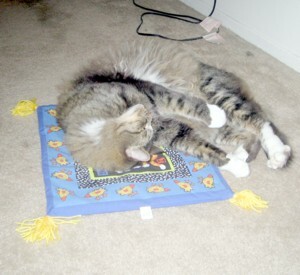 See, whether its a Catnip filled ball, or a Boogie Mat , Daddy never leaves the toy out all day long.